BIBLICAL ANTHROPOLOGY: Is Enoch a Royal Title? Is Enoch a Royal Title? The first three words of the Ten Commandments are: Anochi, Havayah E-lohecha, meaning I am God, your Ruler. The Talmud (Shabbat 105a) questions the word Anochi, (I) which is an unusual form of the pronoun, as opposed to the more commonly used Ani. It is not originally Hebrew. The word comes from a time before Abraham and the cultural context is Nilo-Saharan. Anochi means "I" in the Egyptian language and is refers to the royal first person. It is likely that Anoch, Enoch and Hanock (Reuben's first born son) are variant spellings of the same word, and all refer to rulers. The word anochi is also found among peoples who migrated from the Nile westward, such as the Igbo and the Ashante. Among the Igbo, anochie means “a replacer” or “to replace” and among the Ashante the word anokyi means "Ano Junior" or the "Ano who follows his father." In both cases, one finds the idea of succession from father to son, suggesting a line of descent. A Nigerian friend reports that anochie also means "direct heir to a throne." The biblical word Enoch is clearly associated with royal ascendancy. Enoch is doubtless a cognate of anochi and therefore signifies heir to the throne. Analysis of the Genesis King Lists (Gen. 4 and 5) indictaes that Cain's son was Enoch because he would ascend to the throne. The question is whose throne? As it was the custom for these rulers to have two wives, there were two firstborn sons, and these were heirs to different thrones. The firstborn son of the half-sister wife ascended to the throne of his biological father. The firstborn son of the cousin/niece wife ascended to the throne of his maternal grandfather, after whom he was named. In other words, it appears that Cain's son by his cousin wife was the designated ruler over Enoch I's territory. Another Enoch is named in Genesis 5:18-24. He ascended to the throne of his father Jared. This Enoch was the father of Methuselah and the paternal grandfather of Lamech the Younger. He was a contemporary of Lamech the Elder, whose two wives are named in Genesis 4:23. 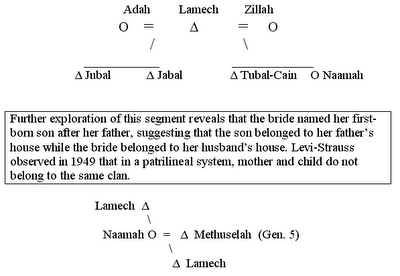 As is evident from this segment of the Genesis 4 and 5 king lists, Enoch's son married the daughter of Lamech and she named their firstborn son after her father, as was the custom for the cousin bride. Lamech the Younger would have ascended to the throne of his maternal grandfather, after whom he was named. It is likely that the biblical name Enoch is a royal name or title and that its origins are best explained by looking to the Nilotic peoples. Here again we have evidence that Abraham's ancestors came from Africa, as is attested by Genesis 10. 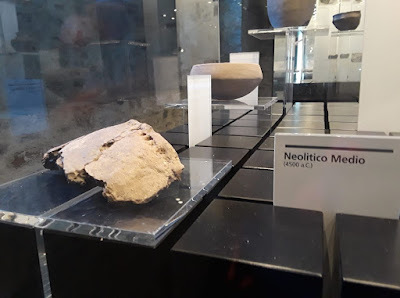 Another theory about the etymology of Enoch further suggests a connection to the Nilotic peoples. The late Achieng Oneko was a political freedom fighter in Kenya. Oneko is a common name among the Nilotic Luo. Oneko is a variant of Enoch. Nek/Neko in Luo is to die or a reference to death, which Enoch is said to have avoided by being "taken" and no more. Abraham is a descendant of Nimrod, the Son of Kush (Genesis 10). Abraham's father was Terah, a ruler-priest whose territory was in the Tigris-Euphrates. This is why we first meet Abraham in that area when we read Genesis. However, his ancestors were Proto-Saharan Nilotes. They come to be known as Kushites. The Kushite kings were the first to unite the Upper and Lower Nile and their priests were Habiru (Hebrew) Horites.